Become the go-to Excel 2013 expert with this self-paced online course! 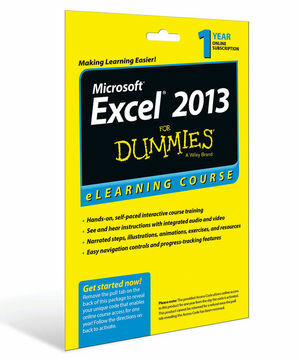 The Excel 2013 For Dummies eLearning Course Access Code Card gives you instant access to the Excel 2013 For Dummies eLearning Online Course for 12 months at learn.dummies.com. Simply follow the instructions on the card and you are on your way to Excel 2013 success! This online, self-paced course guides you through the fundamentals of Excel 2013 using an easy-to-follow, step-by-step approach and shows you tips and tricks that help you get the most out of Excel 2013. The Microsoft Office suite is the most widely used in the world, and Excel 2013 has expanded its functionality and it has a clean, new look that is sure to please veteran and new users alike. Excel is an essential tool for home and business, and the Excel 2013 For Dummies eLearning Course Access Code Card is your key to efficiency, versatility, and productivity. http://www.dummies.com/go/fdactivatepin Activate the online test!